A moon is a moon is a moon ... not so! There are a lot of ways to be creative with the moon in artistic photographic compositions. One of the concepts I love to explore from time to time is the idea of timelapse in a still. We see the moon, yes. Yet a timelapse shows the movement of the moon; its ascent and travel to the right in this case (the rise). 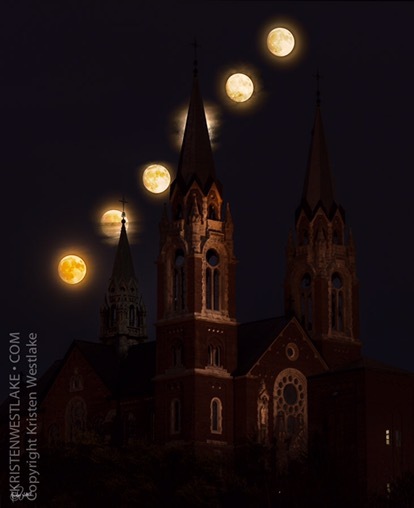 The Supermoon rising over Holy Hill ; 5 minute time lapse shows the ascent and travel pattern of the moon.